Carolyn Genders is an award-winning East Sussex artist. 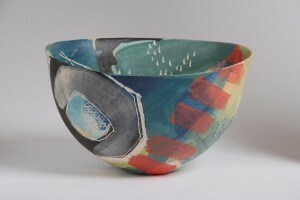 She embraces the ancient technique of coiling to create inimitable hand-built contemporary ceramics, reflective of the beautiful Sussex landscape. Nicholas Toovey tells us more. Carolyn believes she was born a ceramicist, aged four she made pots for her mother from clay she found in the garden. She obtained a BA honours degree at Brighton and after graduation set up her first studio. 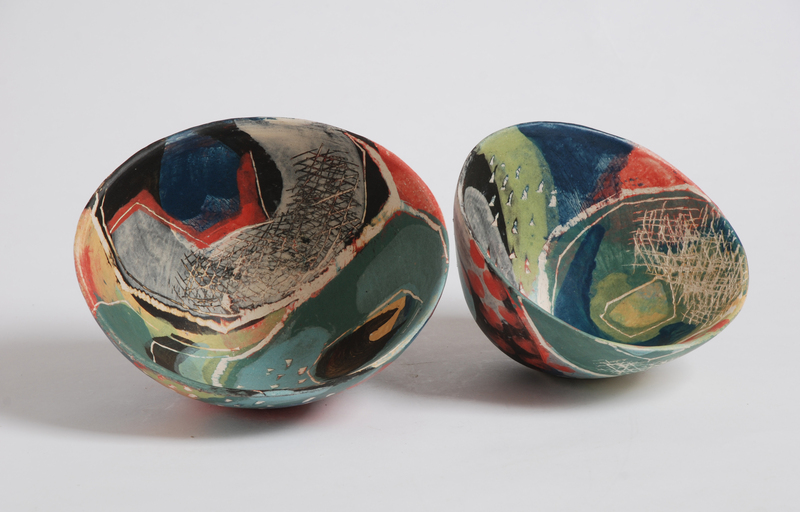 Later, Carolyn obtained a Postgraduate diploma in Ceramics at Goldsmiths College, London. 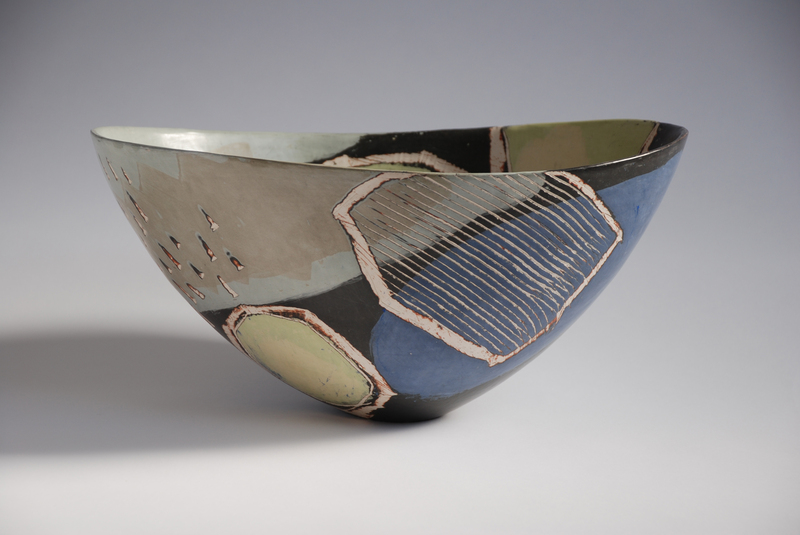 She is a fellow of the Craft Potters Association and a published author of ‘Sources of Inspiration’ and ‘Pattern, Colour and Form’. 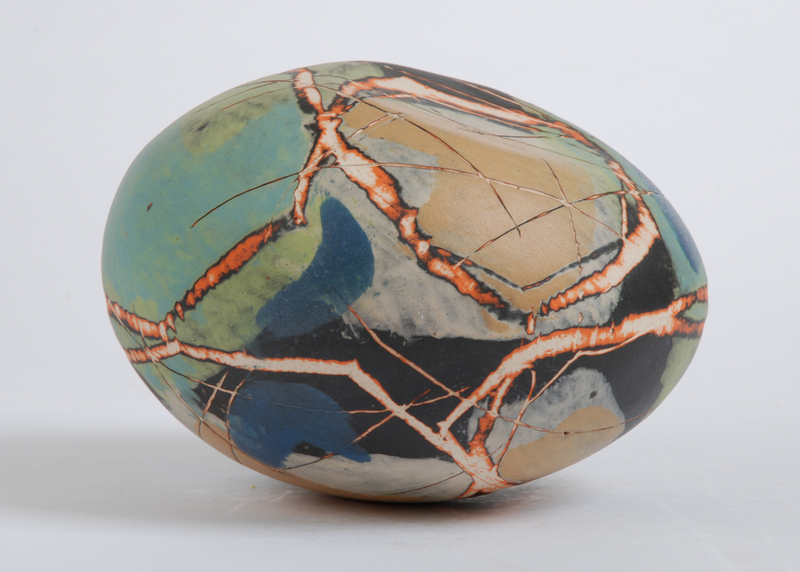 Carolyn often teaches at West Dean College, but ensures that the majority of her time is spent creating her own work. Arriving at her studio in Danehill, you are taken aback by the magnificent view of the High Weald and instantly recognise why it has been designated an Area of Outstanding Natural Beauty. You are also greeted by Ludo, a sweet-natured dog who lives up to his name in wanting to play. Carolyn’s studio is light and well organised. Shelves are neatly arranged and brimming with containers of coloured slips, oxides and stains, interspersed with found objects such as shells, pebbles and pinecones. A few surfaces are adorned with trial pieces, many appear as finished vessels, others are fragmented references of firings and colours. These shelves surround the central work table where several works in progress are concealed by bags preserving the moisture in the clay, amassing mystery in what might be unveiled. A large window looks out across the Ashdown and Sheffield Forests towards the distant Downs. Hidden from view around a corner of the room are her three electric kilns. Up a small flight of stairs in the opposite corner is a small gallery space with an offering of finished pieces, all vying for attention and demanding to be touched. Born in Singapore, Carolyn moved to Sussex with her parents as a child, since then she has grown up in the county and cannot understand why anyone would want to live anywhere else. Is she inspired by her Sussex surroundings? Yes definitely. 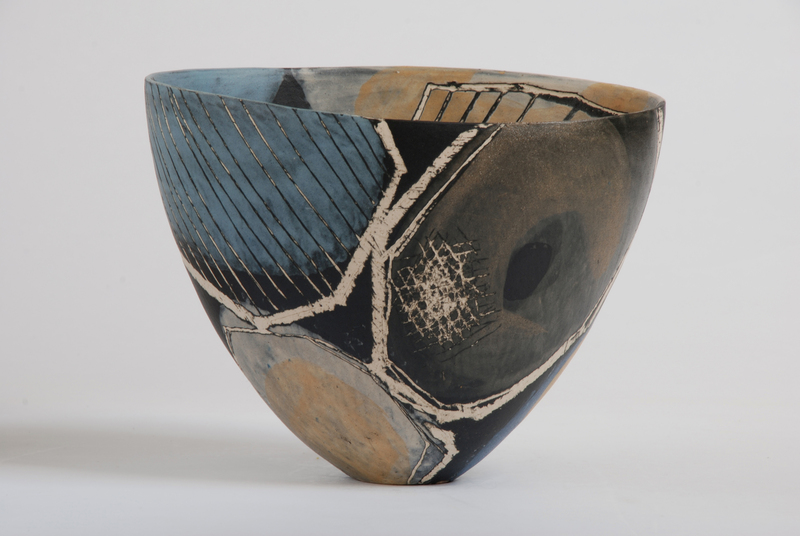 Although it may not be instantly obvious when looking at her ceramics, the Sussex landscape has been a source of inspiration for the majority of Carolyn’s recent output. 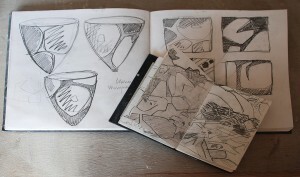 A small sketchbook contains vigorous drawings made of her impressions of her surrounding landscape, these are still abstracted but are certainly more identifiable. 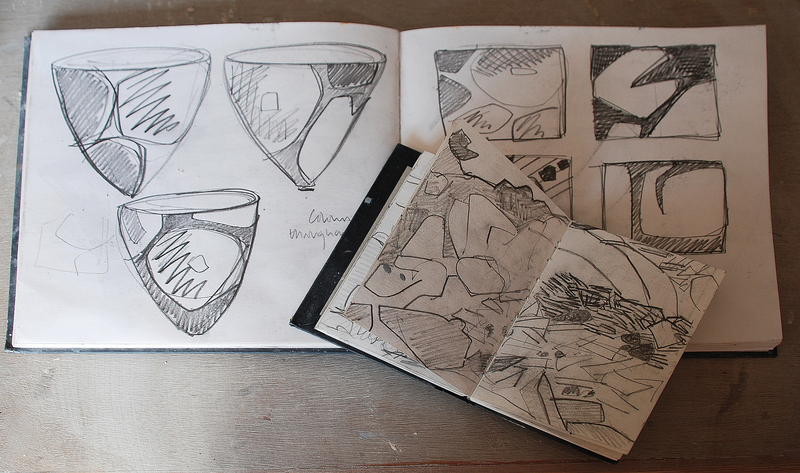 A larger sketchbook moves these drawings on to designs, selecting elements from the initial drawings and merging them with outlines of vessels and forms with occasional colour references. None of these will ever be made as Carolyn works in a spontaneous and free way. She aims to give the impression she feels when in the Downland landscape, rather than a literal translation of what a camera would record. Carolyn combines the rhythm, colours, light and balance of the view, with brushwork and textures seen in her paintings and prints, to create a reflection of a lifetime of inspiration. She works on a series of vessels all at the same time, each in a different stage of production. This approach keeps her mind fresh, it also allows for play, which Carolyn believes is very important for the progression and exploration of any artist. 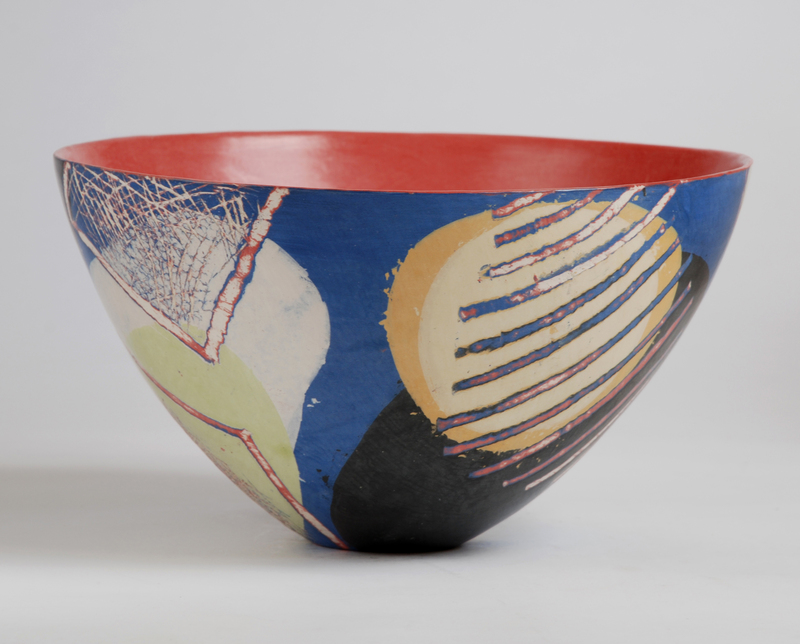 By making changes to the outlines of the forms, different sgraffito marks and colour variations, each piece will have a completely different identity, united by a subtle intrinsic theme. 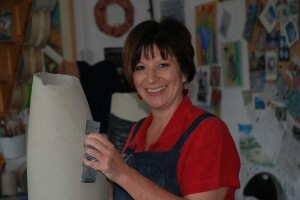 The majority of Carolyn’s work is hand-built using the ancient technique of coiling, this involves methodically building up the shape using rolls of clay, pinching and pulling the form upward over a period of days to avoid collapse. Once built, the body is painted in coloured slips, either vitreous or burnished terra sigillata depending on the desired finish. A process of mark-making then begins to reveal the layers below. Carolyn loves the equilibrium of the old techniques and the contemporary surface treatment. Whilst intuitive, the form and balance is carefully considered, unlike a flat canvas, the three dimensions add exciting and challenging possibilities in how the exterior, interior and form will all work harmoniously. Whilst sculptural forms are always prevalent, the artist confesses open vessels are her primary love. Carolyn has been actively exhibiting her work since 1981 and is now an established and highly-regarded ceramicist. 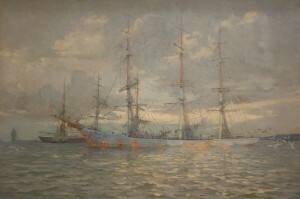 She has exhibited in Continental Europe, Japan and throughout Britain. 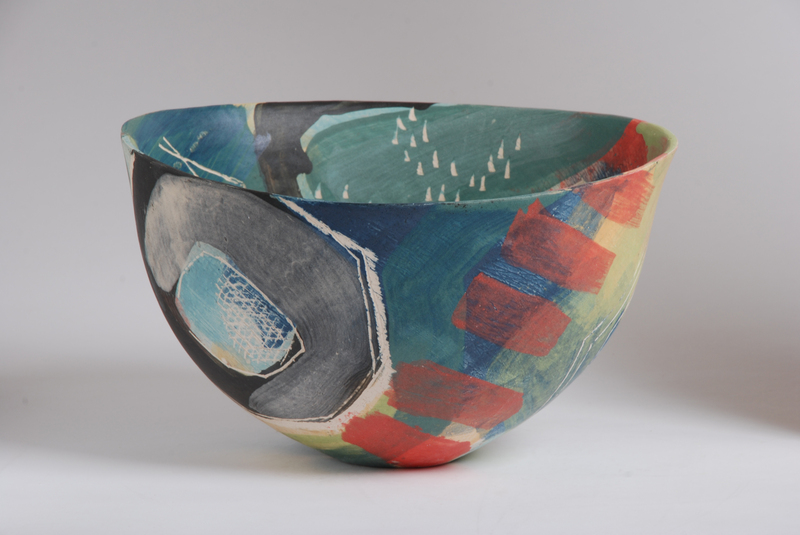 From 16th June to 2nd July, her ceramics will be featured in a group exhibition with Shirley Crowther Contemporary Art in the ‘Summer Exhibition’ at the Jointure Studios, Ditchling. The recently renovated workshop of the renowned modern British artist Sir Frank Brangwyn offers the perfect backdrop for her eye-catching works. The gallery is open from noon until 5pm on Thursdays, Fridays and Saturdays. 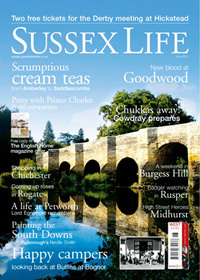 Nicholas’ article was originally published in Sussex Life magazine in June 2011. 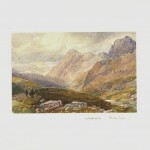 The June Sale of Selected Paintings and Prints will be held on 15th June 2011. The sale starts with Lot 1, an important watercolour album compiled by the relatively little-known artist R.H. Manning as a present for his niece. The album hints towards Manning being a collector as well as an artist. He obviously asked a number of his contemporaries for a small watercolour for inclusion in the album and so it includes works by David Cox Junior, James Duffield Harding, Henry Gastineau, Henry Pilleau and William Leighton Leitch to name but a few. The works on paper have largely survived in excellent condition hidden from sunlight and dust in the pages of the album. The album carries a presale estimate of £3000-5000, click here to view the contents of the album and see a detailed collation of the contents. The Select Sale continues with two watercolours and an oil on board by the highly collectable Cornish artist Henry Scott Tuke (1858-1929). 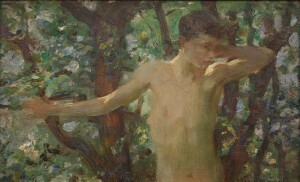 ‘Half Length Study of a Boy’ is a small oil on board (12 x 19cm) by Tuke highlights his mastery of capturing light. It is beautifully presented in a gilt frame which carries a David Messum gallery label to the reverse adding important provenance to this unsigned work. Lot 4 is offered with a presale estimate of £6000-10000. Continuing with the Cornish theme is Lot 14, a beautiful painting of Schooners in a Cornish Estuary by the artist Frank Kelsey (1864-1932). In contrast with the Tuke, this oil on canvas is very large, measuring 89cm x 135cm excluding the wide gilt wood section frame. Showing size does not always dictate value it is offered with a presale estimate of £2000-3000. Measuring 100 x 135cm, another large oil on canvas within the auction is Lot 76. 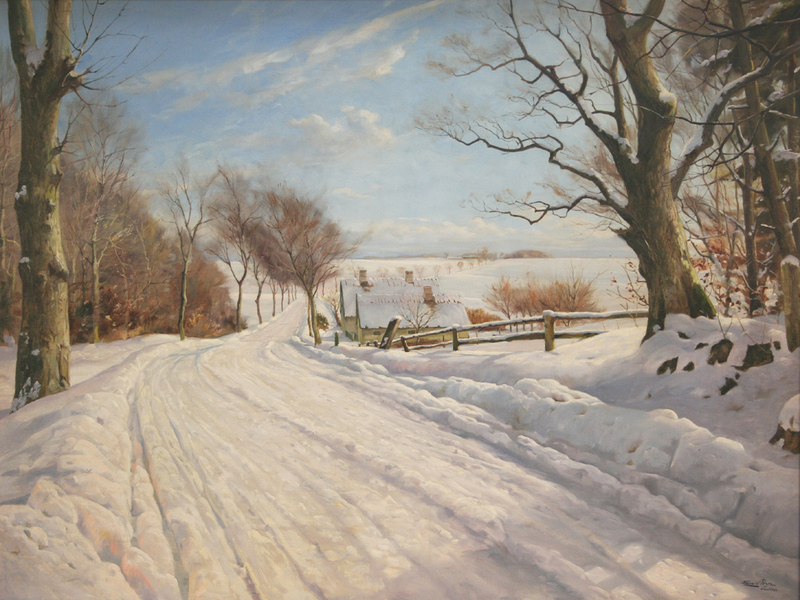 A work by Danish artist Harald Pryn (1891-1968) titled ‘Gandløse’. 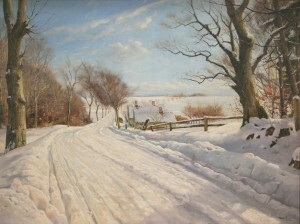 This painting of a lane near Copenhagen glistens under the artist’s handling of snow. This lot is estimated at £1500-2500. 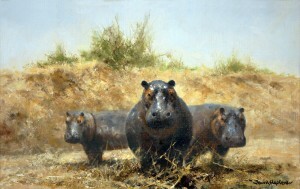 The auction also includes four original oils on canvas by David Shepherd (click here for more information). To view all the paintings, drawings and prints within the June auction please click here. The June sale continues with Silver, Jewellery, Medals & Militaria, Oriental Ceramics & Works of Art, British & Continental Ceramics & Glass, Furniture, Metalwork and Collectors’ Items, Textiles and Rugs. In addition, on the 14th June Toovey’s hold their Specialist Sale of Toys, Dolls and Games. To view the free online catalogue please click here. 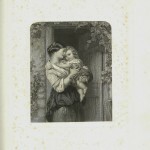 Lot 1 within Toovey’s sale of Selected Paintings and Prints on 15th June 2011 is an important album compiled by the artist R.H. Manning for his niece, containing fifty-six works on paper by various hands, thirteen related photographs and three prints, the majority mounted, circa 1860-1865, most inscribed below the work with artist’s name and title by Manning, all contained within a contemporary blue and gilt tooled leather binding. R.H. Manning – ‘Bronze Statue of San Carlo Borromeo at Arona Lago Maggiore’, pencil heightened with white, titled, approx 13cm x 18cm. 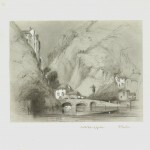 [and] R.H. Manning – ‘St Goarshausen on the Rhine’, pencil heightened with white, titled, approx 13cm x 18cm. 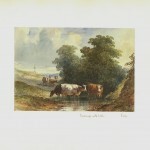 Attributed to Henry Earp – ‘Landscape with Cattle’, watercolour, approx 12cm x 17.5cm. 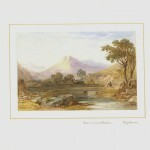 David Cox Jnr – ‘In North Wales’, watercolour, signed, approx 10.5cm x 16.5cm. 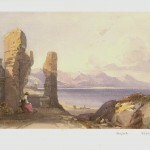 William Leighton Leitch – ‘Lake of Garda’, watercolour, signed and dated 1861, approx 11.5cm x 17cm. Attributed to Daniel Fowler – ‘On the Lake of Garda’, charcoal heightened with white, approx 13.5cm x 17.5cm. 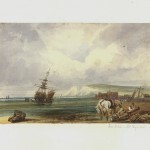 R.H. Manning – ‘Minster Isle of Thanet’, watercolour, approx 13.5cm x 20.5cm. James Duffield Harding – ‘A Study’, pencil heightened with white, signed with initials, approx 16.5cm x 25.5cm. 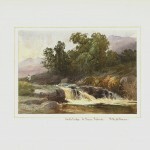 David Hall McKewan – ‘On the… Co Down, Ireland’, watercolour, signed, approx 10cm x 14cm. 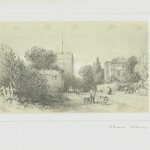 A mid/late 19th Century engraving on india paper mounted, ‘From a Picture in the possession of R.H Manning’, approx 14cm x 17cm. 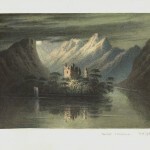 Cornelius Pearson – ‘Loch Adway Perthshire’, watercolour, signed and dated 1861, approx 10.5cm x 17.5cm. 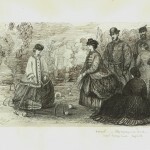 K. Wicksteed – ‘May Day’, pen and ink heightened with white, signed and dated Dec’r 9th 1861, approx 15cm x 22.5cm. 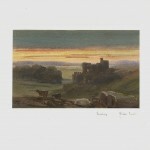 Henry Gastineau – ‘View in Carmarthenshire’, watercolour with pencil traces, approx 10cm x 15cm. 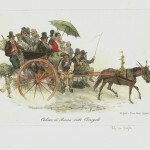 A mid/late 19th Century hand-coloured lithograph, ‘Calesso di Resina ditto Carrigolo’, approx 15.5cm x 23cm. 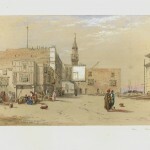 A mid/late 19th Century watercolour over pencil, ‘Life in Naples’, approx 29cm x 19cm. Attributed to B.E. Kennedy – ‘Coast of Genoa’, watercolour, approx 10.5cm x 18cm. R.H. Manning – ‘St Lawrence’, pencil heightened with white, signed with initials, titled and dated 1861, approx 12.5cm x 20cm. 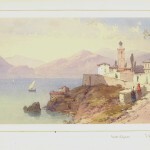 Thomas Charles Leeson Rowbotham – ‘Coast of Genoa’, watercolour, signed and dated 1861, approx 14.5cm x 24cm. 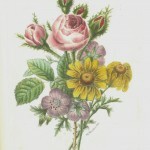 M. Robertson – Study of a Spray of Flowers, watercolour and pencil, signed and dated 1862, approx 24cm x 17cm. Attributed to James Duffield Harding – ‘Ladram Bay, Devonshire’, charcoal heightened with white, approx 11cm x 16cm. G.M. 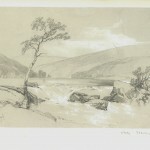 Robinson – ‘Metzingen’, pencil heightened in white, signed with initials, approx 25cm x 17.5cm. 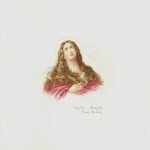 Attributed to Fanny Blacksley – ‘Magdalen after Guido’, watercolour, image size approx 8cm x 9cm. Attributed to H.A. Spitta – ‘Composition’, watercolour, approx 10cm x 15cm. 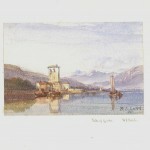 R.H. Manning – ‘Bellagio Lake of Como’, watercolour, approx 11cm x 21cm. Attributed to ?Clara Montalba – Interior Scene, watercolour and pencil, inscribed below image ‘…cut out from a letter from Madlle Montalba aged 13 to her father in London, 1860.’, approx 12.5cm x 12.5cm. 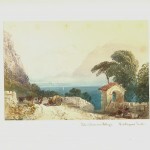 Attributed to John Smith – ‘Composition Italy’, watercolour, approx 14.5cm x 19.5cm. 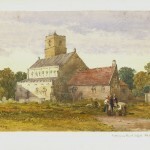 C. Groves – ‘Garlinge near Margate’, watercolour, signed and dated 1861, approx 13.5cm x 21cm. 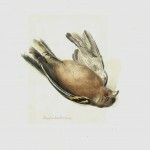 Mary Caroline Blacksley – Study of a Fallen Bird, watercolour, image size approx 10cm x 12cm. 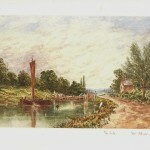 Henry Pilleau – ‘The Lock’, watercolour, signed, approx 14cm x 20.5cm. Note: incorrectly captioned ‘Wm Pilleau’. 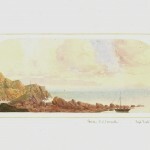 Maria Gastineau – ‘Folkestone’, watercolour, signed and dated 1861, approx 13cm x 20cm. Sept. Scott – ‘Bude, Ct of Cornwall’, watercolour, signed with initials, approx 8.5cm x 19.5cm. 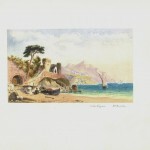 R.H. Manning – ‘Elizabeth Castle, Jersey’, watercolour, approx 9cm x 16.5cm. 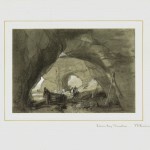 [and] A mid/late 19th Century pen and ink drawing, ‘A Study’, bears signature ‘B. Foster’, approx 8cm x 13.5cm. Note: incorrectly captioned ‘W. Pilleau’. 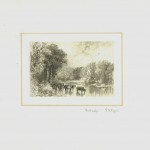 [and] R.H. Manning – ‘The Thames near Goring’, watercolour, approx 10cm x 8.5cm. Attributed to T.I. Toper – ‘Landscape’, monochrome watercolour, approx 6.5cm x 10cm. 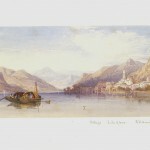 William Collingwood Smith – ‘Lake of Como near Bellagio’, watercolour, signed, approx 12.5cm x 18.5cm. 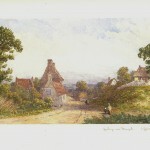 William Leighton Leitch – ‘Haywards Heath’, watercolour, signed, approx 11cm x 17cm. 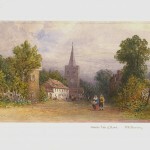 R.H. Manning – ‘Coddenham Church, Suffolk’, watercolour, signed with initials and dated 1860, approx 17.5cm x 25cm. 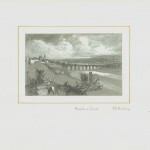 James Duffield Harding – ‘Berwick on Tweed’, pencil heightened in white, approx 8.5cm x 13cm. 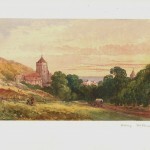 Attributed to Henry Pilleau – ‘Hastings’, watercolour, approx 13.5cm x 21.5cm. 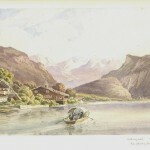 Attributed to Möller – ‘At Brieng Switz’d’, watercolour, approx 18.5cm x 27.5cm. 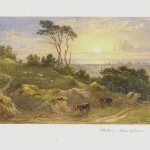 David Cox Jnr – ‘Evening’, watercolour, signed, approx 10cm x 15.5cm. Attributed to William Leighton Leitch – ‘Aberystwith from a sketch by R.H.M.’, watercolour, approx 16cm x 24.5cm. R.H. Manning – ‘Florence’, pencil heightened with white, titled, approx 13cm x 18.5cm. [and] R.H. Manning – ‘Villa Serbelloni, Bellagio Lake of Como’, pencil heightened with white, titled, approx 12.5cm x 18.5cm. R.H. Manning and J.D. Harding – ‘S. 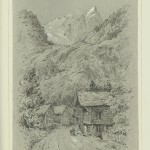 Goarshausen’, pencil heightened with white, approx 12.5cm x 17.5cm. [and] R.H. Manning – ‘On the Rhine’, pencil and charcoal heightened with white, approx 12.5cm x 17.5cm. Attributed to H.A. Spitta – ‘Moonlight, a Composition’, watercolour, approx 16cm x 23cm. 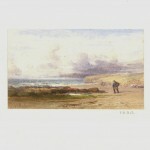 John Henry Mole – Coastal View, watercolour, signed and dated 1862, approx 10cm x 16.5cm. 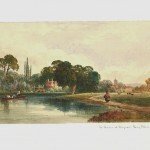 Henry Pilleau – ‘The Thames at Wargrave’, watercolour, signed and dated 1862, approx 12.5cm x 20.5cm. Attributed to B.E. 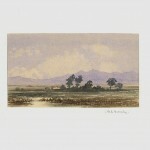 Kennedy – Landscape, watercolour, approx 7.5cm x 13cm. 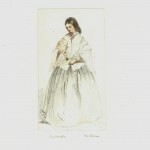 Attributed to Henry Pilleau – ‘My Daughter’, watercolour, pencil and ink, approx 4cm x 8cm. C.B. 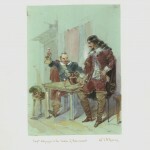 Young – ‘Captain Culpepper & the Master of Ravenswood’, watercolour, approx 18cm x 13cm. 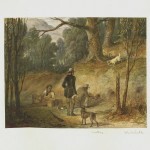 Aster Corbauld – ‘Ferreting’, watercolour, indistinctly signed, approx 15.5cm x 19.5cm. 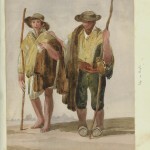 Henry Pilleau – ‘Suez’, watercolour with pencil, signed with initials and titled, approx 15.5cm x 24cm. 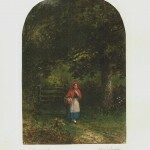 Aster Corbould – ‘Thro the Wood’, watercolour, signed and dated 1862, approx 19.5cm x 14cm. 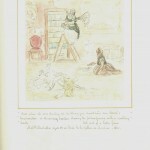 M. Montague Lamb – ‘Croquet’, pen and ink, signed with initials, approx 15cm x 22.5cm. 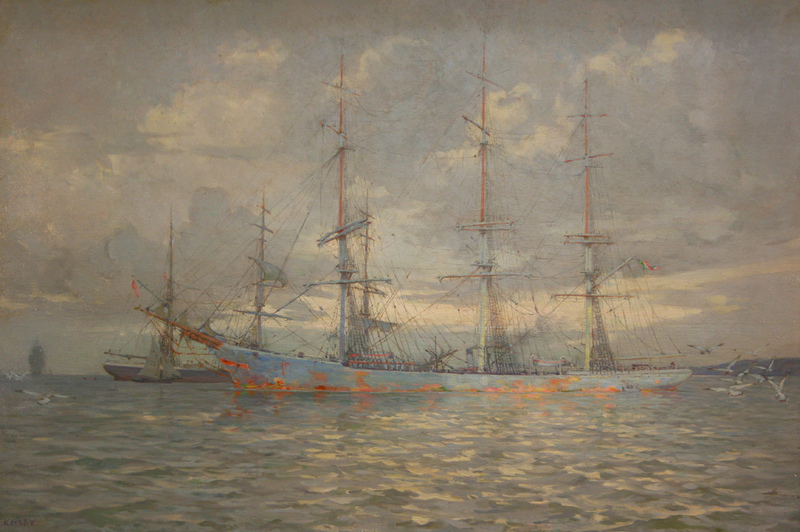 Attributed to ‘Mrs Lydiard’ – ‘Sea Side’, watercolour, approx 13.5cm x 20.5cm. R.H. Manning – ‘Bronze Statue of San Carlo Borromeo at Arona Lago Maggiore’, pencil heightened with white, titled, approx 13cm x 18cm. 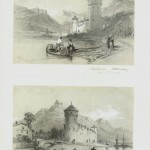 R.H. Manning – ‘St Goarshausen on the Rhine’, pencil heightened with white, titled, approx 13cm x 18cm. 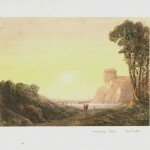 R.H. Manning – ‘Elizabeth Castle, Jersey’, watercolour, approx 9cm x 16.5cm. 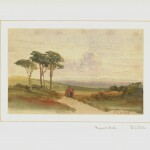 A mid/late 19th Century pen and ink drawing, ‘A Study’, bears signature ‘B. Foster’, approx 8cm x 13.5cm. Note: incorrectly captioned ‘W. Pilleau’. 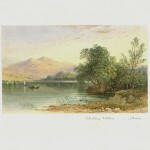 R.H. Manning – ‘The Thames near Goring’, watercolour, approx 10cm x 8.5cm. R.H. Manning – ‘Florence’, pencil heightened with white, titled, approx 13cm x 18.5cm. 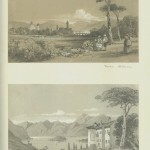 R.H. Manning – ‘Villa Serbelloni, Bellagio Lake of Como’, pencil heightened with white, titled, approx 12.5cm x 18.5cm. R.H. Manning and J.D. Harding – ‘S. 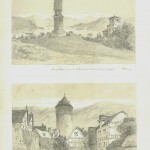 Goarshausen’, pencil heightened with white, approx 12.5cm x 17.5cm. R.H. Manning – ‘On the Rhine’, pencil and charcoal heightened with white, approx 12.5cm x 17.5cm. 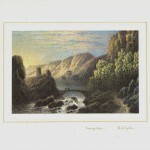 Photographic reproduction of a work by R.H.M. of the Rhine [Not illustrated]. Cutting from the Illustrated London News with a wood-engraving of a picture in the collection of R.H. Manning [Not illustrated]. 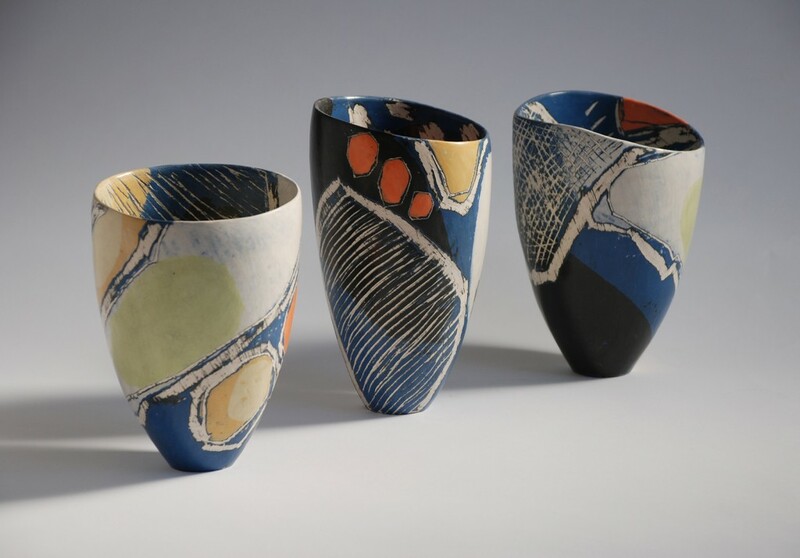 The June issue of Sussex Life (pictured left) is currently in the shops and features an article by Nicholas Toovey on the East Sussex ceramicist Carolyn Genders, his fourth article in the magazine to date. The articles allow Nicholas to further promote Sussex-based contemporary artists and reinforces Toovey’s annual Contemporary Art Auctions. The magazine also has a fabulous diary section with things to do in the county this month, available now for £3.65. 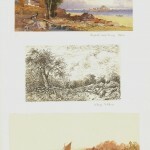 The Sale of Selected Oil Paintings, Watercolours, Drawings and Prints will be held on June 16th 2011. 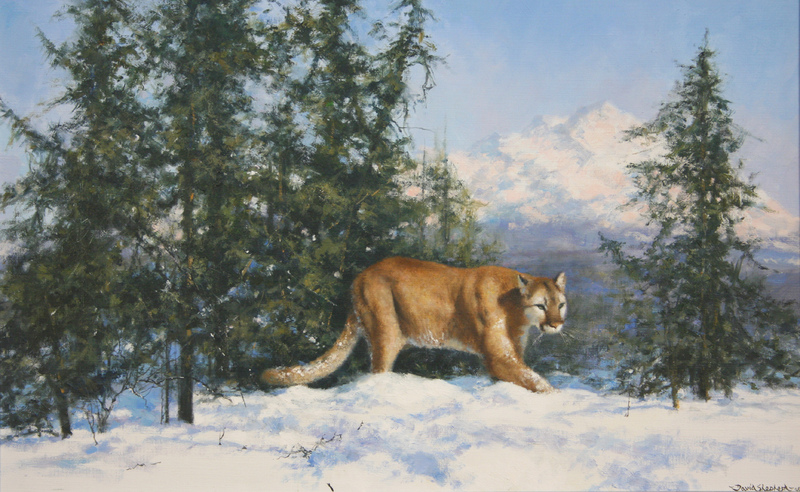 The sale includes four original works by David Shepherd (born 1931). Shepherd is a famous painter of animals and the offering in the auction includes depictions of a cougar, rhinoceros and hippopotami. Known for his limited edition colour prints, this is an opportunity to purchase an original work by the artist. 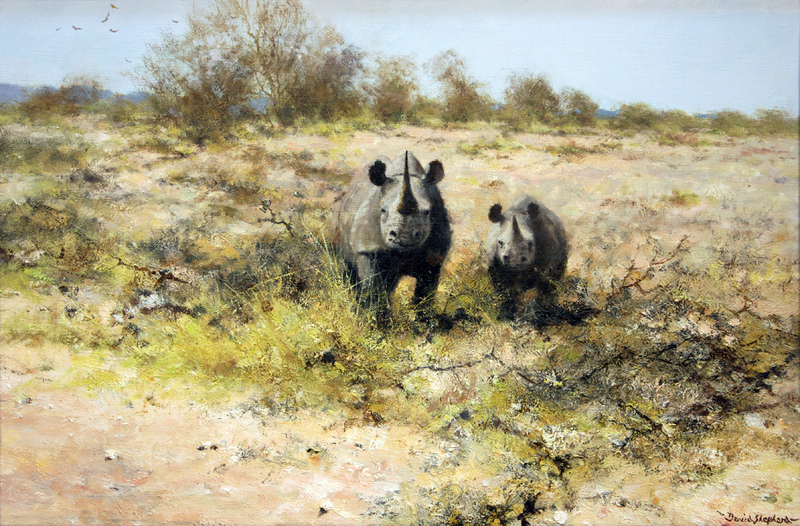 Lot 58 is titled ‘Rhinos in Namibia’ and has an adult rhinoceros and its calf in the African Landscape. The 33 x 51cm signed oil on canvas is dated 1999 to the reverse and is presented in a gilt frame. The pre-sale estimate is £6000-9000. Lot 59 is an oil on canvas of three hippopotami in their natural habitat. This is the smallest of the four works included in the sale measuring 22 x 34cm excluding the swept gilt composition frame that surrounds the painting. 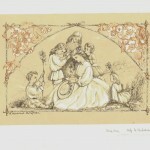 This signed work is dated 2001 to the reverse and has a presale estimate of £3500-4500. 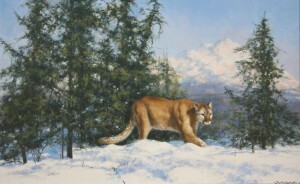 Lot 60 departs from the African theme with a snowy landscape and a beautifully executed cougar (or mountain lion) amongst trees. Measuring 44 x 70cm, this signed oil on canvas is presented in a silvered frame echoing the tones in the painting. It is dated 1997 verso and is estimated at £8000-12000. 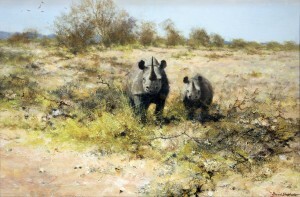 Completing the selection of original works by David Shepherd offered in the auction is Lot 61. 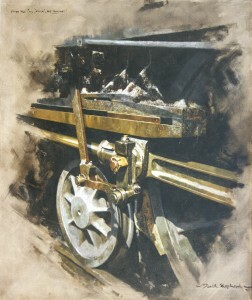 It is a departure from his animal work and shows another facet of his output with a detail of a locomotive titled ‘Study for oil “muck” and Sunlight’. In addition to being a vocal conservationist, David Shepherd is a steam locomotive enthusiast, owning many engines, most of which are displayed at museums around the world. It is therefore no surprise that in addition to painting animals locomotives often feature in his work. This sketch in oils on canvas measures 75 x 63cm and is sympathetically framed in a painted frame. This final work of the group is the largest and has a pre-sale estimate of £2000-3000. All four works were consigned for sale by the same single-owner. They join a diverse selection of other works by fantastic names offered for sale at Toovey’s Auctioneers and Valuers this June.